The most loyal of our readers may recognize the outrageously talented Dana Cree below, whose columns here at ChefsFeed navigated the world of an acclaimed pastry department, took you behind the scene's as a dairy's culinary director, and taught us about the rare beast that is the chef vacation. All the while, she was plugging away on perhaps the only ice cream book you will ever need again — Hello, My Name Is Ice Cream, out today. Cree has a certain knack for breaking down complicated, glorious pastry moves for us mere mortals (just try and screw up this donut ice cream! You can't! ), on full display in her latest endeavor. Baked goods do something peculiar when boiled with milk: they dissolve and become stretchy and elastic. Throw the mixture into a blender, and this strange concoction becomes velvety and thick, like pudding. I first encountered this magic trick at a restaurant full of them, called Alinea. There, a pudding made by boiling brioche and cream was served with raspberries for an elegant “toast-and-jam” bite. Since then, I’ve applied the same principle to just about every other kind of bakery treat I can get my hands on—like gingerbread or devil’s food cake. Most recently, I’ve been reducing glazed donuts to a velvety pudding to flavor ice cream. Buy the most delicious glazed donut you can find. This might be from a local shop where donuts are hand-forged, or from Krispy Kreme, or even from your grocery store’s bakery case. And don’t stop at donuts; you can use this recipe with any cake, cookie, or pastry you desire. Makes between 1 and 1 ½ quarts ice cream. Commercial stabilizer: 3g | 1 teaspoon mixed with the sugar before it is added to the ice cream base. Guar or xanthan gum: 1g | 1/4 teaspoon whirled in a blender with the ice cream base after it is chilled in the ice bath. Tapioca starch: 5g | 2 teaspoons mixed with 20g | 2 tablespoons of cold milk, whisked into the ice cream base after it is finished cooking. Cornstarch: 10g | 1 tablespoon plus 1 teaspoon, mixed with 20g | 2 tablespoons of cold milk, whisked into the simmering ice cream base, then cooked for 1 minute. Place the cream, milk, sugar (1), and glucose in a medium heavy-bottomed saucepan over medium-high heat and cook, whisking occasionally to discourage the milk from scorching, until it comes to a full rolling boil. Add the donut to the dairy, breaking it up with a whisk while you stir it in. Reduce the heat and cook at a low simmer for 2 minutes (4), whisking occasionally to help break up the donut. Blend the base. Remove the pot from heat and carefully transfer the hot base to a blender. Add the vanilla and salt, and start blending on low speed at first, increasing gradually to full speed, to avoid the hot liquid jumping out the top. When the blender is on high, continue blending for 1 to 2 minutes, until very smooth (3). Immediately pour the base into a shallow metal or glass bowl. Working quickly, fill a large bowl two-thirds of the way with very icy ice water. Nest the hot bowl into this ice bath, stirring occasionally until it cools down (2). Place the base into the bowl of an ice cream maker and churn according to the manufacturer’s instructions. 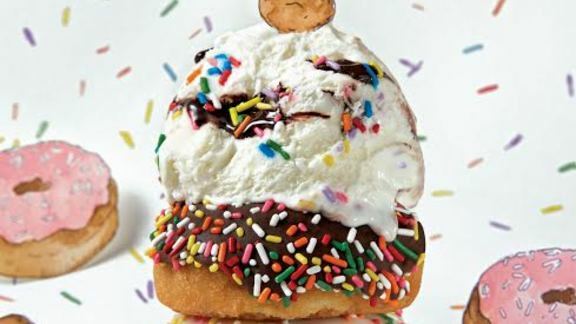 The ice cream is ready when it thickens into the texture of soft-serve ice cream and holds its shape, typically 20 to 30 minutes. To freeze your ice cream in the American hard-pack style, immediately transfer it to a container with an airtight lid. Press plastic wrap directly on the surface of the ice cream to prevent ice crystals from forming, cover, and store it in your freezer until it hardens completely, between 4 and 12 hours. Or, feel free to enjoy your ice cream immediately; the texture will be similar to soft-serve. 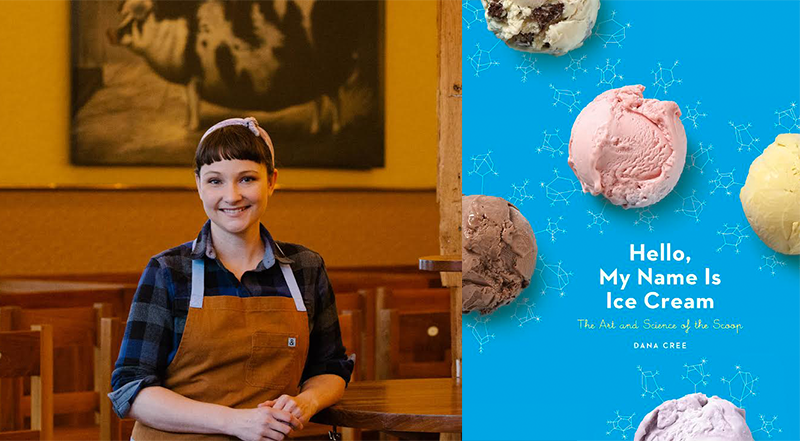 Hello, My Name Is Ice Cream: The Art and Science of The Scoop is now available. When the big boss bows out. Pastry chef Dana Cree on why the only way up in the world of restaurant pastry is often out.